Wong tong -- Chinese brown sugar -- imparts a distinctive taste. Wong tong -- Chinese brown sugar -- imparts that distinctive taste identified with the Chinese confections of gau (a sticky mochi rice dessert), gin dui (fried mochi balls) and Kong Sui Ban (tea cookies; see "By Request," above). You'll need to become familiar with this ingredient to make these treats in the traditional way. Wong tong is cane sugar and water pressed into dense bars about a half-inch thick. You'll need to break it up and dissolve it in boiling water before using in a recipe. A half-pound is roughly equal to 1 1/2 cups of regular brown sugar. 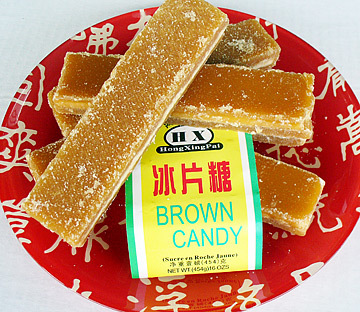 Wong tong is sold under the name "Brown Candy" in Chinatown markets such as Sun Chong, Wing Cheong and Shung Chong Yuein, for less than $1 a pound. The common brand is Hong Xing Pai. You'll probably have to ask for it, as it can be hard to find on crowded shelves. The folks at NoKa Chocolate present a glossy "Tasting Guideline" in every box and strongly advise you to take the experience seriously. It's probably not necessary to clear your palate with water, take three deep breaths and sniff the chocolate as you would a fine glass of wine when you're dealing with your favorite treat from the vending machine. But the folks at NoKa Chocolate present a glossy "Tasting Guideline" in every box and strongly advise you to take the experience seriously. Then again, if you spent $854 for a pound of the confection, you probably wouldn't need to be told. If that sounds like the kind of life you should be leading, head over to Neiman Marcus' Epicure Department to learn more from chocolatier Katrina Merrem. She'll visit the third floor of the Ala Moana store from 3 to 6 p.m. Saturday. If the chance to try something so exclusive isn't indulgent enough, carefully chosen wines will be served to complement what Forbes.com called the "World's Most Expensive Chocolates." 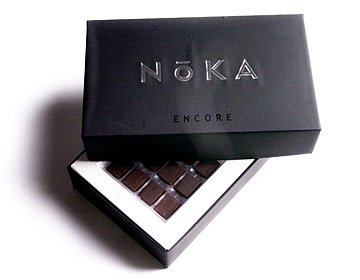 A sampler box of NoKa Chocolate includes four small pieces made from cacao of various regions -- Venezuela, Trinidad, Ivory Coast and Ecuador. It starts at $16.